"Where the mind is without fear and the head is held high ....." Where the morning begins with this philosophy of Rabindranath Tagore, where students are encouraged and prepared to participate fully, to be self-advocates, to take risks and to create lasting memories and relationships with their peers and staff, where learning is a celebration, and I am proud to be the Academic Director / Principal of such a nurturing staff and a member of the 'Oak Valley Family'. Into yet another new Academic Session, a trail of developments mark the significant changes that took place over the year in shaping up the school as it stands today - an educational edifice! The predominant approach to optimize the learning potential of every student, irrespective of the complexity of variables inherent in their environment, is our mission. "Each human being is born with a unique set of potential that yearns to be fulfilled as surely as the Acorn yearns to become the OAK within it"- Aristotle. We at 'OAK Valley' unfold these unique set of potential / talents of each individual child and transform them to excel for a great future. "The aim of education is the knowledge, not of facts, but of values" - William S Burrough and in the words of Dr. APJ Abdul Kalam - "Knowledge is a combination of Creativity, Righteousness and Courage, which can generate enlightened citizens". So, we endeavor towards a value based learning environment where the students are determined to follow good and avoid evil. At 'OAK Valley' we enthuse our students by creating for them, a world they can revel in. 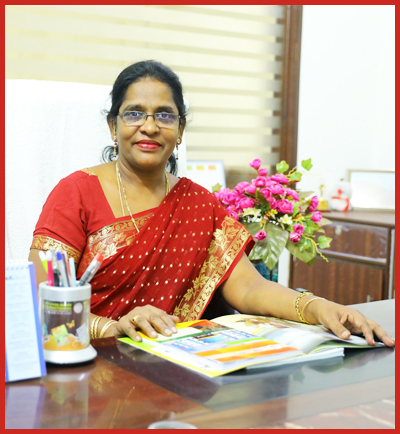 We prepare them for real life to accept challenges, face competition, take failure and triumph in the same stride by providing them with an atmosphere for multifaceted intellectual development in a holistic, student-centric environment where effective, significant and joyful learning takes place. "I cannot teach anybody anything, I can only make them think"- Socrates. We help them to have a clear goal and surge ahead to realize it. "As the waves surge ahead to touch the shore, The rains surge ahead to reach the land, - We surge ahead to build a strong character by blending culture and modernity with education, that nurtures a positive outlook for becoming a global citizen with Indian values, for peace and a purposeful life." We touch their hearts – with our concern about their overall health and wellbeing, encompassing their mental, physical, emotional and spiritual dimensions - transforming them to excel in whatever they do. Each child is identified, nurtured, and encouraged by providing them with a dais to think, express, exhibit and explore their latent talents. The 21st century learners need more techno - based teaching and we have taken a step ahead and established digitized classrooms providing Interactive Smart Boards with digital content and animated videos along with activities, experiments and internet facility. Our Scholastic, Co-scholastic and Extra-curricular activities promote confidence, direction and analytical thinking, to transform young minds into refined, well adjusted, adaptable and integrated personalities. Our students venture into the world with the strength, not only to reach and excel in their professional aspirations, but to remain as learned human beings with a sound character, great values and a well-groomed personality, striving for academic excellence fulfilling the OAK VALLEY'S motto: "Hand In Hand We Learn." I am deeply moved by the unity and cooperation of my devoted teaching and admin staff, the unstinted support of the School Management, the respectful love of my students, the shoulder to shoulder child care of the responsible parents and above all the enlightened guidance of the Lord Almighty which are together helping in transforming the school into 'An Institution with a Difference'!